Yesterday Mark and I drove down to Andover MA to meet with Walden. We three are running a (pro-bono) session for a Coop consulting group next month on technology strategy. Because Kate wasn’t feeling well, we went to Panera for three hours. The place was hoppin’ with businesspeople! 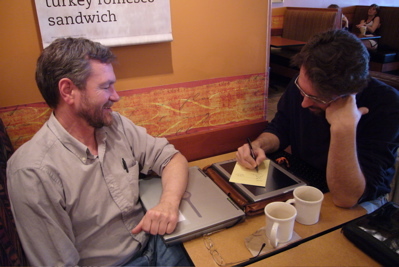 Above you see Walden coaching Mark on the use of an important strategic technology tool – the pen and paper. They’re really amazing! You can write in any light, without any battery power, on both sides of the device. You’re not restricted to “documents” or linear formatting. You can create an unlimited number of pages no matter how little memory you have. There are a whole raft of accessories to collect, sort, organize, and store your notes – and they’re all cheap! File folders cost a nickel or something, nothing like the cost of a hard drive upgrade. And you can use pen and paper on any surface, even including a computer tablet! If you look closely, you can see that Walden is carrying this toolset in his front pocket! Just try doing that with your fancy new MacBook.